A news report in Wednesday’s paper indicated that a weak La Niña system is building up in the western Pacific, which will result in heavier than normal rainfall throughout Asia. Sure enough seems to be the case here in Bangkok where, despite reports of a severe drought in the northeast of the country, we have had quite a bit of rain to kick off rainy season. Late Monday morning we had several hours of nonstop torrential rain, much more than we usually get at one time. As you can see from the picture taken from my balcony, the soi (alley) on which we live was flooded enough to brush the undersides of passing taxis. My poor maid was caught in the rain while eating lunch on her way from one of the other houses she cleans to our condo. She was eating at a streetside vendor and stayed there under and umbrella, hoping to wait it out. When the vendor asked where she was heading, he shook his head and told her that the area floods and that she had better head out right there and then, or else abandon all hope. Sure enough, when she arrived at the condo she was soaked. I told her that next time it is raining so hard she should just call and cancel; no need to brave the floods. 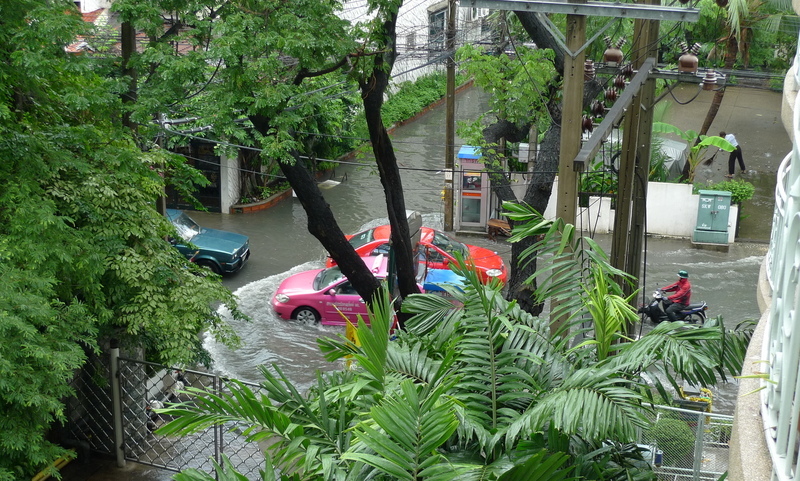 A bit later she pointed out that where she lives out by Sukhumvit Soi 101, the sois don’t flood. With all the expensive condos around here, she tsked, the streets shouldn’t flood. So much for location, location, location! I’m headed to the airport. Talk to you soon. This entry was posted in Uncategorized and tagged Bangkok, Flooding, Krungthep, rain, Soi, weather by christao408. Bookmark the permalink. The rain/floods is not much better here. Close to 4 inches in less than 48 hours in already saturated soil. Don’t forget your umbrella! Have a safe trip and I’ll see you on Saturday. Hope the rain stops before the situation gets too much worse Chris ! @oldpartner – Rats, am in Taipei already and made the conscious choice not to bring my umbrella…@Chatamanda – After about three hours it did and about two hours after that the flooding had subsided. I met an expat Brit once who was a civil engineer specialising in water systems. He said that given its elevation (under sea level), Bangkok’s system does a decent job handling the torrential rains. But it still gets overwhelmed. Yikes. I wouldn’t mind borrowing some of that rain here. It’s 100 degrees and no rain recently. @z_stands_for – As an American, having a maid was a concept that took me a few years to get over. Labor is very inexpensive here, so I have a lady come in twice a week for about two-three hours each time to clean our two units. Ultimately, it worked out to a pretty simple math equation as my time is worth a whole lot more in a purely monetary sense than what I’m paying her, and I’m paying her quite well by local standards. @Roadlesstaken – Yeah, you guys are having all sorts of bad weather. I just told a Thai friend in NY that she should come back to the COOLER weather in Thailand, and how often can I say that to somebody? It’s raining a lot in Delhi too, much more than the usual. I’m loving it… even with the nasty traffic jams and flooding in some areas. Please remember to pack the rain. Desperately needed. Sincerely, Tired of Watering P.S. Drat! You don’t need a housekeeper. (sigh) oh how I long for rain! Yes, I can definitely confirm the wetter-than-usual weather here in SE Asia. Hey, we even had floods in Orchard Road a few weeks back. Sounds like too much of a good thing… Hope Tawn stays dry! I’ve always wondered how you folks kept your place so neat and tidy.